We know that not everyone can afford a brand new luxury sedan, which is why we offer used cars under $5K at Rome Pre-Owned in Rome, NY. Not everyone is in the market for a brand new car. Some of us are just starting out in life and need a truly affordable and reliable car that can get us to work or school. Some of us are buying our teens their first car, and let’s face it; why buy a new driver a brand new car when they have a higher chance of putting a few scratches and dents in it. Let Rome Pre-Owned show you why it is a great idea to buy used cars from our incredible selection under $5K. 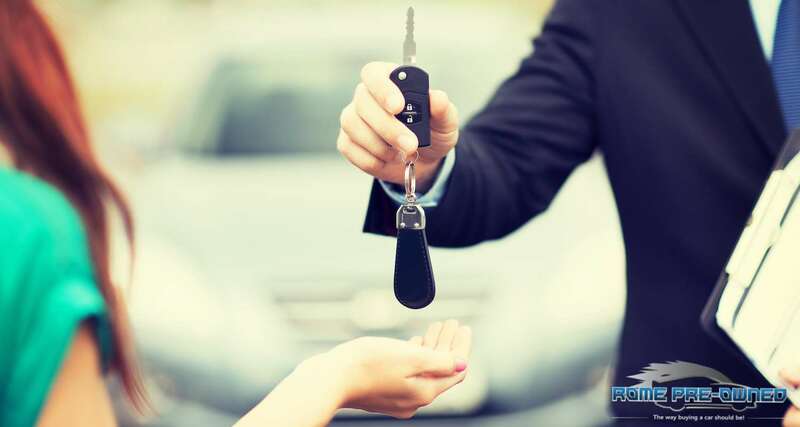 This one is pretty obvious and goes without saying, but when you buy used cars, you get huge savings and can keep your hard earned cash in your bank account where it belongs. Buying used allows you to avoid depreciation that comes with buying a brand new car. A new car can sometimes devalue from $5,000 on up depending upon the car as soon as you drive it away from the dealership. Let someone else eat that cost and buy used instead. You can also get more bang for your buck when you buy used because you can upgrade features you may not have been able to afford a brand new car. Everyone loves a bargain, and some people are on a tight budget, that is why we are proud to offer reliable used cars under $5K for our customers at Rome Pre-Owned. Many people may be leery of purchasing a lower cost car thinking that there may be something wrong, or that it seems to be good to be true. When you buy used cars under $5,000 from Rome Pre-Owned, you know you are getting a great deal and a reliable car. That is because we fully inspect every vehicle that comes to us for mechanical, safety, and cosmetic defects before we allow them to be put up for sale on our lot. If we find they are too far-gone, we won’t sell them because we want to offer only the best, most reliable used cars to our customers. You won’t find that kind of reliability from a private party seller on sites like Craigslist and OfferUp. You may even inherit their car troubles if you don’t know what to look for. Get your used car at Rome Pre-Owned and get the confidence you need at a price you can afford. At Rome Pre-Owned, we believe it is important to back our used cars with a warranty that works for you. Of course, we can say they are reliable, but we go further by offering a warranty on each car we sell. This is not a 50/50 warranty, not a limited warranty, but a full BUMPER-TO-BUMPER warranty that covers every component of the car so you can be confident that you are getting a dependable and reliable car for your commute, no matter where your drive takes you. Can a private seller back up their used car with a warranty? Probably not; and most of the time, they won’t fully disclose everything about the car they are selling because they need to unload their car problems and they know they won’t get top dollar if it isn’t in good working order. We’re here to give you the assurance and confidence you deserve to have in a vehicle purchase. We believe it is important to be transparent about the vehicles we sell. That is why at Rome Pre-Owned we give you all the information you need about each and every used car we carry so you can make an informed buying decision. In fact, we offer a FREE CARFAX Report on every one of our vehicles so you can see if they have been in an accident, maintenance records, how many owners the vehicle has had, the status of the title, the last reported miles, and more. We even put a link to Kelley Blue Book on our site so you can see that our prices are more than fair. Get started today by browsing our inventory online, then come down and take a test drive. We look forward to meeting you.